Second post for today. Here is my first post. Welcome to a new Runway Inspired Challenge – Emilio De La Morena! The skirt reminded me of brush strokes stamp set which were hot some time ago. I have a few of them and decided to find them and use it. Here is my take on the challenge. I picked the colours from the skirt to ink and layer stamp them. I did a white panel and it looked fab! I trimmed the panel at an angle to adhered on the bottom of the card front. I added a black glitter strip of paper as border. Stamped the sentiment at the angle. 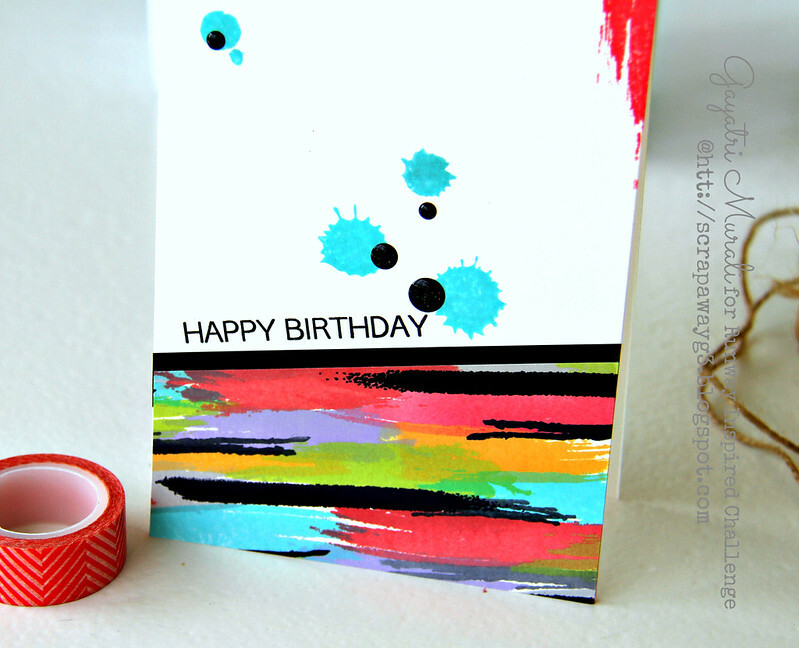 To tie in with the brush strokes, I added a few spatter in blue and a brush stroke in red on the top of the card front. Finally embellished with sparkly black enamel dots. Here is a closeup! For more DT inspirations using the new challenge, check our Runway Inspired Challenge blog. Fantastic interpretation of this challenge. I have a brushstroke stamp & am anxious to try something similar! I LOVE this card. I do have the Brushstroke Stamp set. Going to give this a go. You made a card awhile ago using TE and Grouchy Grumplings…ink splats , so I had to have those stamp sets too. I love the look on cards. Sooooooooo, thank you for your inspiration. Love this striking card! (it actually made a smile pop out of me when I saw it!) So clean and colorful – Thanks for sharing! This is awesome! Love the bright bold colors. 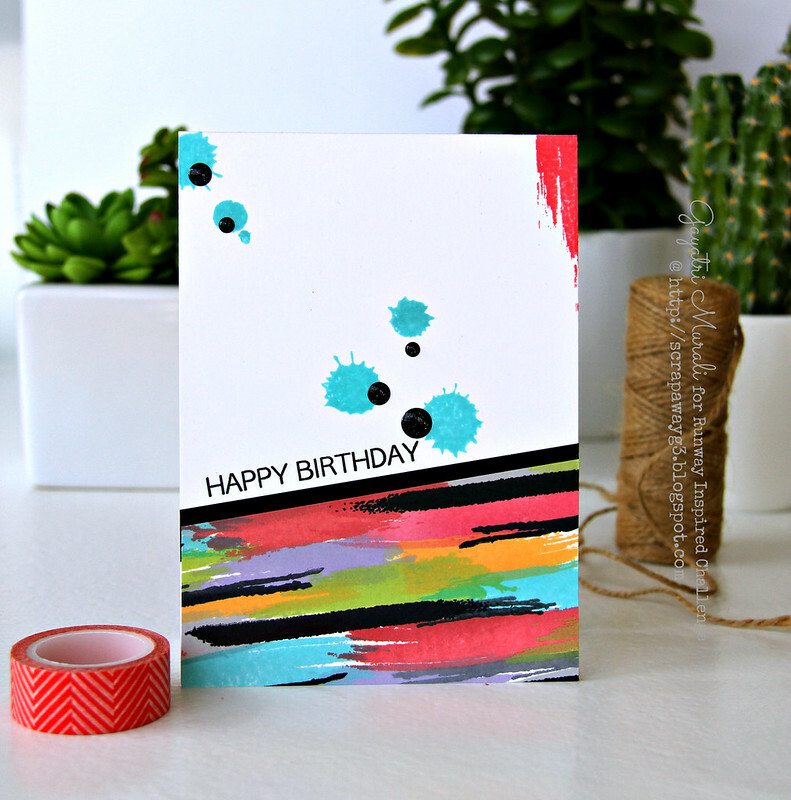 Really wish I had these brush stroke stamps…they are just so cool! !